Sound waves are, technically, not amplified in the cochlea. The answer to your question, however, is that outer hair cells amplify the acoustic signal in the cochlea. To answer your question what mechanisms exist that amplify sound within the cochlea - none. What is amplified within the cochlea is the traveling wave that moves across the basilar membrane. The cochlear amplifier is mediated by the outer hair cells. 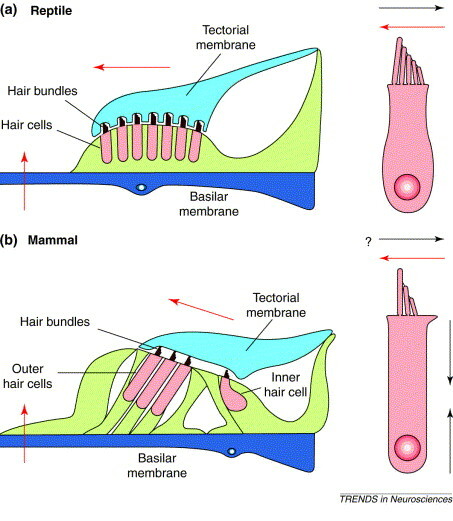 These outer hair cells are thought to be able to contract and extend when the basilar membrane moves and thereby amplifying the traveling wave (Fig. 1). The middle ear ossicles as you say do amplify the acoustic sound, but they are situated in the middle ear, as is the tympanic membrane, which also amplifies sound by funneling a large contact surface onto the small stapes footplate.This is not the answer to your question, as they are all middle ear structures. Not the answer you're looking for? Browse other questions tagged neuroscience biophysics sensation hearing human-ear or ask your own question. Are unilaterally deaf people able to determine where sound comes from? How does the human ear guess the direction of the source?